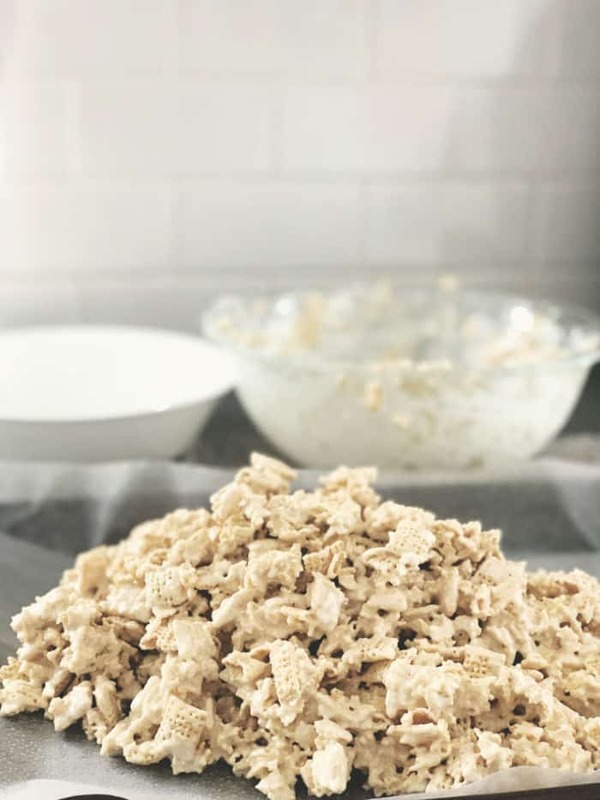 Here’s a fun way to spice up marshmallow cereal treats. 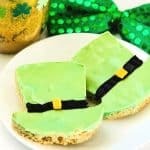 Make these cute leprechaun hat St. Patrick’s Day treats for kids to bring as a school snack or enjoy at home. 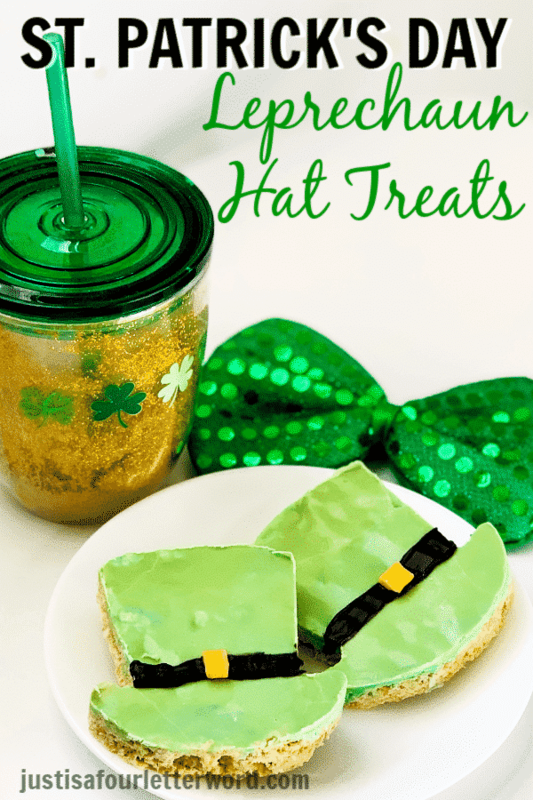 We love any excuse to make a cute and fun dessert so I thought I’d share this fun leprechaun hat St. Patrick’s day treats recipe. This is super fun and so easy to make. My kids never get tired of these treats, no matter what shape they are in. If I’m honest, making these is as fun for me as it is for my kids and that’s the way it should be right? I call that the luck of the Irish. Or something. My posts contain affiliate links, which means I may earn a commission on purchases made after clicking my link. We have a thing for Leprechaun hats around here so I decided that in addition to wearing them, we could make them! 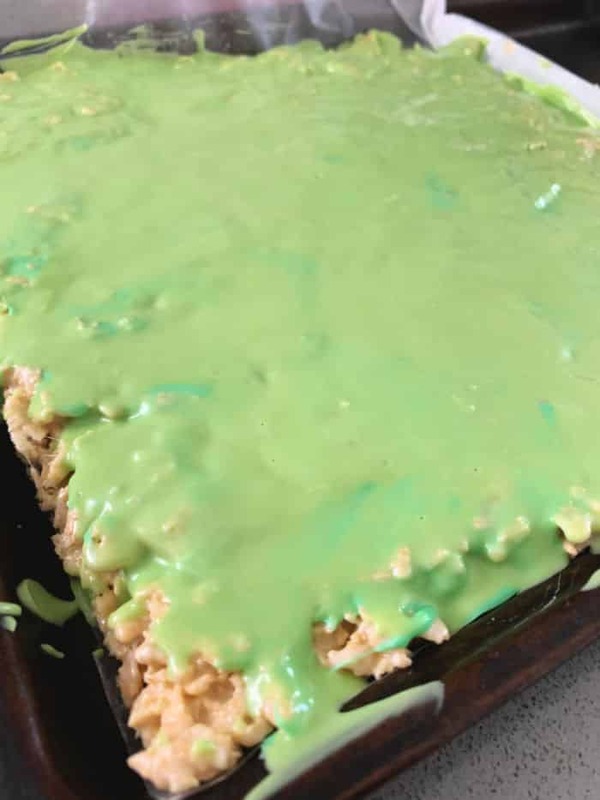 My St. Patrick’s Day treats are pretty simple using just a few ingredients and a microwave. That’s right, you don’t even have to bake them! 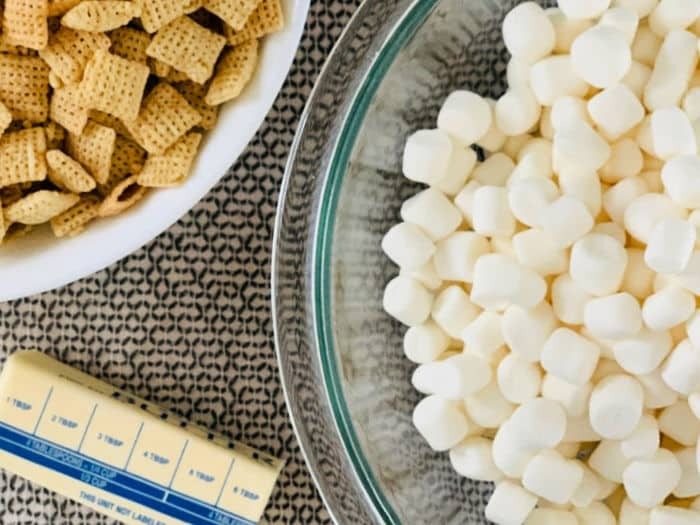 Start by melting together your butter and marshmallows, add some vanilla and mix in your cereal of choice. 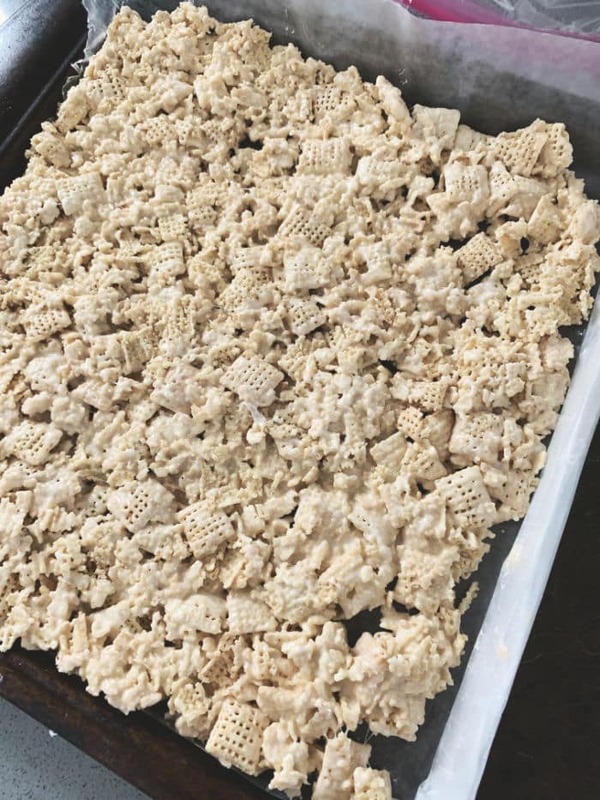 We used Rice Chex for ours since General Mills so kindly sent it to us, but you can use whatever you want. Mixing it all together is probably the trickiest part of this process. I find that coating my spoon AND hands with cooking spray helps a TON. Then when I press it into the pan, I also coat the pan or wax paper. As the mixture cools a bit, you can begin melting your candy. I always add a bit of shortening to the melts to get the right consistency. I would go ahead and melt two bags to be sure you have enough coverage. Place your cookie sheet in the fridge so the candy can cool and harden again. Once that is done, you can begin cutting out your hats. A note on this, the size of your St. Patrick’s Day treats will depend on the size of your cookie cutter. I used this top hat cookie cutter that I found on Amazon and really only got 4 hats and they are pretty big (3.5 in each to be exact). I cut the rest into squares and even made a couple lumpy rainbows and I assure you, they were just as delicious. The smaller your cookie cutter, the more hats you will end up with. Then, just use the black melted candy for the hat band and add a non-melted piece of yellow candy for the buckle. Simple as that! You could use a few as bait with one of these Leprechaun trap ideas. Personally, I’m adding these treats to my kids’ lunches for a fun surprise in the middle of the day and yes, I may have had a few bites myself. 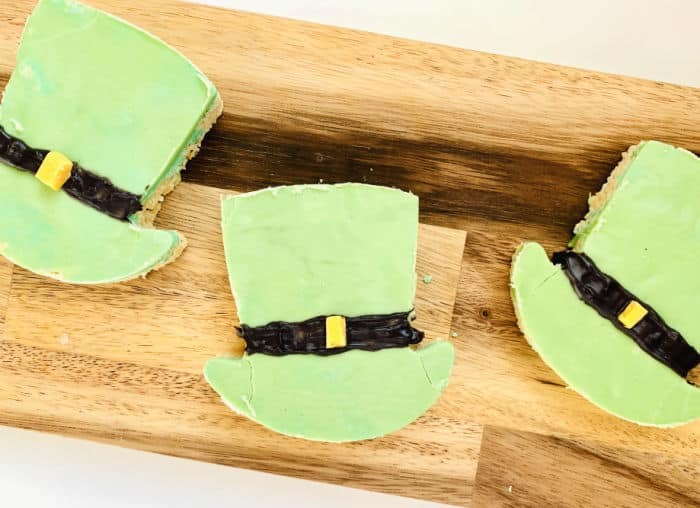 Make this tasty recipe for St. Patrick’s Day treats and enjoy with your littlest leprechauns. We love them! If you’re looking for a few more ideas, check out our roundup of sweet and savory St. Patrick’s Day Snacks for the whole family. 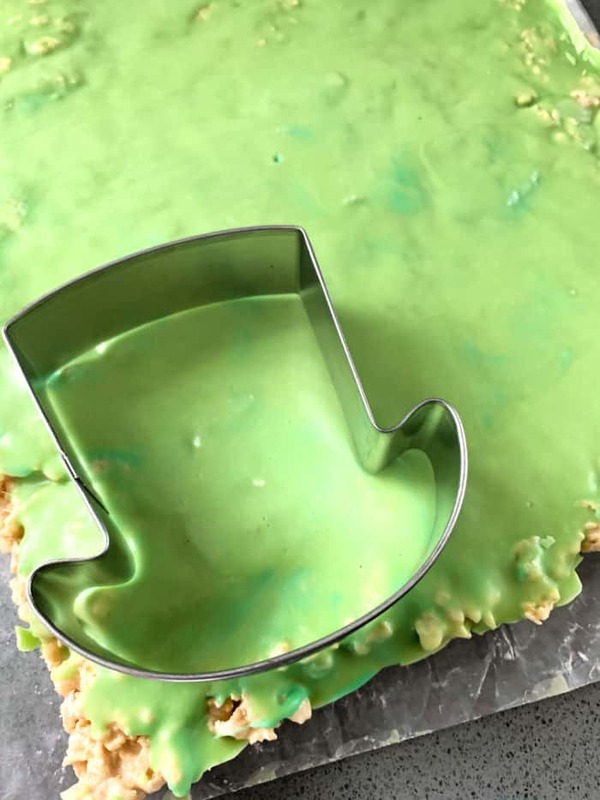 Make these super easy and festive St. Patrick's Day treats for kids with just a few ingredients and a top hat cookie cutter. Melt butter and marshmallows together in the microwave 30 seconds at a time, stirring often.